Earlier this year, BSP supremo Mayawati and SP chief Akhilesh Yadav announced that they will fight from 38 and 37 seats, respectively while leaving two for the Congress in Uttar Pradesh. Rajnath Singh said the soldiers had been demanding bulletproof jackets since 2009, but in vain. Seeking to drive a wedge between alliance partners SP and BSP, Union minister Rajnath Singh on Sunday said Samajwadi Party will have to bear the consequences of teaming up with the Mayawati-led party in the Lok Sabha elections. Addressing an election meeting at Dataganj, he said, "... Samajwadi Party (SP) does not know what big mistake it has committed by forging an alliance with the BSP. It will have to bear the consequences." Earlier this year, BSP supremo Mayawati and SP chief Akhilesh Yadav announced that they will fight from 38 and 37 seats, respectively while leaving two for the Congress in Uttar Pradesh. The seats that were left out by the SP-BSP alliance included the Gandhi family''s stronghold of Amethi and Raebareli. 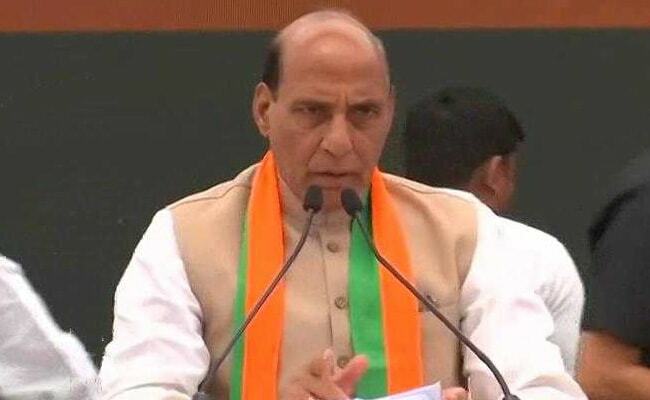 The Union home minister also said that barely 13 days after the Pulwama terror attack, ''revenge'' was taken. Mr Singh was referring to the air strikes carried out by the Indian Air Force (IAF) on terror camps in Balakot.